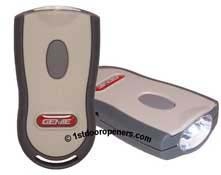 This index contains ALL of the available remote control transmitters for Genie Intellicode, Overhead Door CodeDodger, and all other garage door opener brands and models manufactured by the Genie Company. G1T-BX works with all Genie Intellicode and OverHead Door CodeDodger garage door openers 1995 to current. One button visor mounted or key ring remote control transmitter. Homelink compatible. Battery (CR2032), visor clip (108389), and programming instructions included. No key ring included. 2 3/4" x 1 1/4" x 1/2". GM3T GenieMaster™ works with all Genie products and brands. 9 or 12 switch 390MHz formats. Intellicode 1 or 2 390/315MHZ. All CodeDodger formats. OverHead Door 3 position switch formats 390MHZ frequency ONLY, Genie gated community receivers and remotes. 3 button visor mounted remote control transmitter. Battery (CR2032), visor clip (108389), and programming instructions included. 3 3/8" x 1 15/16" x 1/2". 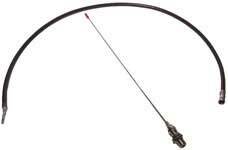 G3T-BX works with all Genie Intellicode 1 or 2 and OverHead Door CodeDodger 390 or 315MHz formats made after 1998. 3-button visor mounted remote or key ring remote. 2 1/2" x 1 3/4" x 1/2". GITR-3 works with all Genie Intellicode and OverHead Door CodeDodger 390MHZ. All 3 buttons will work on openers made after 1998. Only the right button will work on openers made between 1995 and 1998 (date code is found on white sticker found on the power head. Battery (12 volt A23), visor clip (108389), and programming instructions included. GK-BX compatible wireless keyless entry system click here for more information. GM3T GenieMaster™ garage door opener remote control transmitter works with all Genie garage door openers manufactured prior to 1995 that have either a 9 or 12 dip switch (small block of tiny switches or punch out wires) coding format. The dip switch format is found inside your existing remotes battery compartment or inside your “receiver”. The receiver is either attached separately to the main power head of your garage door opener or is built into the main power head. The receiver has a short antenna wire hanging from it. Compatible with 390 frequency only. For a brief period of time Genie manufactured some models of garage door openers that used a dual frequency 315 or 390 receiver and remote. That was approximately between the Fall of 2005 and the Spring of 2007. Below are the replacement dual frequency 315 or 390 remote controls. Older remote control models AT85 and AT35A in mixed frequencies such as 290, 295, 310, 315 are no longer available. NO REPLACEMENT - Garage Door Opener need to be replaced. GM3T GenieMaster™ remote control is the replacement for the GCT-3 remote control for the Genie Gated Community receiver model number 34564R shown below. Operates 1 gate, 390 frequency. Equipped with 9 3 position switch (+,- and 0). Replacement battery for remote control models GIFTD-1, GIFT390-1, 892LT, 894LT. Replacement battery for garage door remote control model numbers GICT390-1, GICT390-3, GICTD-1 GICTD-3, GM3T, GITR-3 ****Replacement battery 12 volt. Check your current remote control for correct battery replacement. Some Genie remotes controls use CR2032 battery.